Stanley Hastings is an aspiring actor and writer who only does PI work to pay the bills. What this usually consists of is investigating the circumstances around accidents for which victims are filing a negligence case through the law practice of Rosenberg and Stone. Then one day a bona fide case is presented to him – a man who wants him to spy on his wife. Hastings has never been on a stakeout, tailed a suspect or used a gun, but how hard can it be to catch a wife with her new man? In Hastings case, pretty tough. And rather than catching her in the act, he’s arrested for her murder. In order to prove his innocence he’s going to need to improve his detection skills and determine who the real killer is. I struggled with Client. It’s a kind of cozy, PI story, where the main character is a bumbling detective who is well out of his depth. 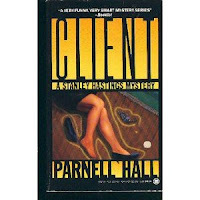 Hall is best when he is writing dialogue, which in places is excellent. But there is far too little of it in this story and, save for Chief Creely and Richard Rosenberg, there is not enough colour or depth to the characters. Not a whole lot happens in the first 100 pages – which also has some asides about bad teeth and buying sanitary towels which try to be humorous but fall flat. 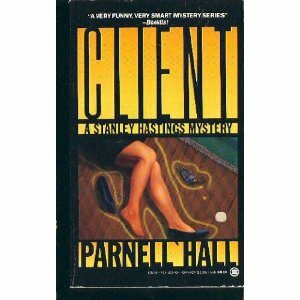 In the latter half of the book the plot unfolds in a very straightforward way when it could have benefited from some twists and turns. Overall, a passable read that needed more dialogue and plot. Rob - Thanks very much for this review. I know what you mean about dialogue, too. Sometimes, a story just needs more dialogue and less description. Proof that not all forgotten books need to be read perhaps. I might be tempted to give one of his other books ago. He can write, but this one just didn't click for me. Well, it clicked for someone else in the household who picked up off a windowshelf and found it funny. So, there you go, proof that taste vary.